For several years, I have helped others to install Gnoetry 0.2 on their computers, and it has rarely been a simple task. For most users, a lack of experience with Linux and command terminals is a major obstacle, as well as the burden of installing and maintaining two operating systems on one machine. After failing with a few eager poets to get the program working on their computers, I have decided to take a different route. I have put together a VirtualBox appliance in an attempt to simplify the whole process so that users with Windows or Mac systems can run Linux and Gnoetry inside of their current operating systems with minimal set up and much less room for error. Currently, Gnoetry 0.2 only runs in a Debian Linux environment (like Ubuntu and Xubuntu). The VirtualBox appliance allows users in Mac OS X, Windows or other variants of Linux to quickly run a virtual machine of Xubuntu with a pre-built Gnoetry program already installed and ready to use from the desktop. 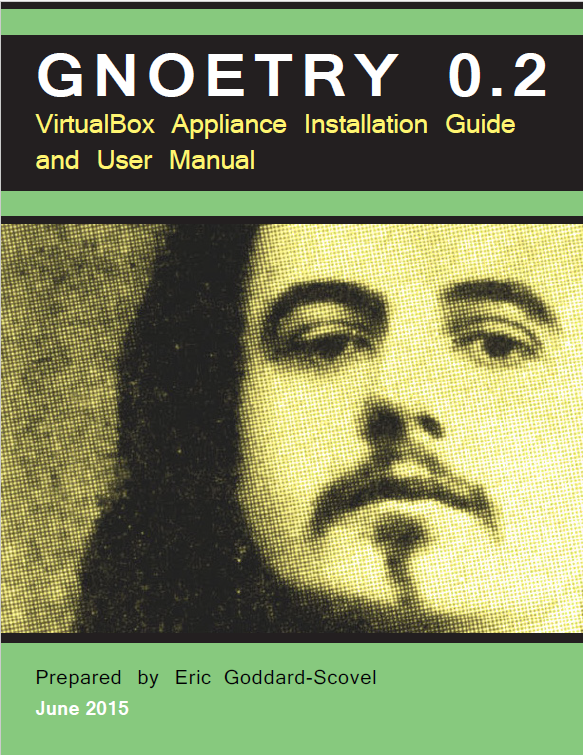 The included user manual will help you quickly set up and use the Gnoetry 0.2 interactive poetry generation software on your computer, regardless of what operating system you are using. The first part of the document will instruct you on what programs and files you will need to download to begin, then it will guide you through the installation of the Gnoetry on Xubuntu 14.04 Virtualbox appliance. The second part covers basic user information about VirtualBox and the Xubuntu virtual machine. Finally, the third part explains in detail how to open and use Gnoetry 0.2, as well as how to add more source texts to use in the program. It is my hope that easier access to Gnoetry will spread its use beyond the small, devoted circle of users it currently has. And if you want to publish you work with Gnoetry, just contact me at escovel@gmail.com to get an account on Gnoetry Daily.